The Sauerland with its diverse landscape is one of Germany's most popular holiday destinations. Elleringhausen is a district of the municipality of Olsberg and is situated in a quiet location. You'll spend your well-earned holiday here in this detached holiday home. The tourist centres of Willingen and Winterberg can be reached by car in just about 15 minutes. 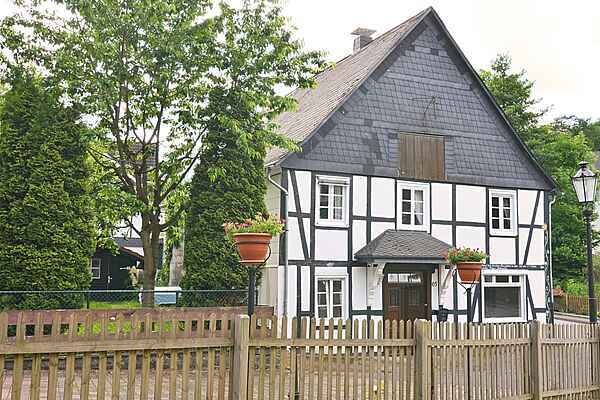 A half-timbered house that was completely renovated with great focus on the interplay of the original details and a contemporary, pleasant feel awaits you. The house provides plenty of space while each room has its own special character. You are free to use the garden with the outdoor furniture and barbecue facilities that invite you to spend time together. Numerous inns, which serve the traditional cuisine of the Sauerland, as well as beautiful half-timbered houses nestled amidst a unique mountain scenery account for Olsberg's special charm. Do you like to have an active holiday? The town and its region provide the ideal conditions for hiking, cycling and winter sports. The Hochsauerland in particular offers families as well as health conscious and active holidaymakers an incredible variety of opportunities. Amusement parks and a multitude of attractions such as castles, mines, caves, museums and breweries leave nothing to be desired. From here, you can easily reach the towns of Willingen, Winterberg, Brilon, Medebach, Meschede or Schmallenberg.